2. 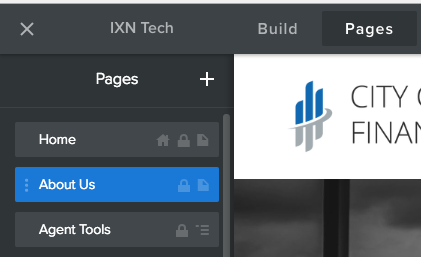 At the top of the screen, there should be different tabs that say, "Build, Pages, Theme, etc." Click on the word "Pages." 3. In the toolbar on the left-hand, you will see a list of all the pages on your website. Click the page you wish to copy or delete. 4. 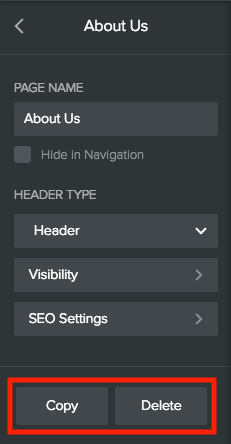 Once you select a page, the left-hand menu will change to show the settings for that page. At the bottom of the menu are Copy and Delete buttons. 5. To Copy- simply click the Copy button. An exact duplicate of the page will be made and placed at the bottom of your pages list. From there you can rename the page, edit the content, and drag drop the page to the desired position in the pages list. 6. To Delete- click the Delete button. You will be asked to confirm this action as a precaution to prevent accidental deletion.